It’s a big milestone birthday for Esta this year: she turns twenty-something . Happy birthday to my favorite seminarian. …No, Esta isn’t 40, but today is one of those other big milestone birthdays for my kid sister. What a long strange ride it’s been: a ballerina, cellist, artist, writer, Wahoo, archaeologist, financial analyst, sometime blogger, preacher, and all around great person. 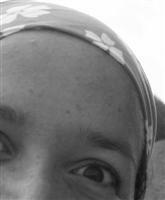 I’d be happy to recommend her as one of the finest people I know… odd incriminating bandana’d pictures notwithstanding. And she’s just entering the best years of her life, whether she knows it or not. Feel free to send her happy birthday wishes using this handy spam-free form. Or check out her 2001 proto-blog on this site (her personal blog is no longer available). Esta has been too busy to post for most of this semester, but wrote late Sunday night/Monday morning about her debut as a preacher. She had quite a baptism by fire, though I have to say that even compared to preaching a sermon at a retirement home and co-leading morning chapel, the most difficult of the three experiences for me would have to be helping to lead worship at the church in which we grew up. I can say that from experience. In high school I gave a sermon in that church one Youth Sunday. If I recall correctly, I was quite the judgmental little snot, too. Of the two of us, I’m really glad that Esta was the one that got this particular Call. Her gifts are so much more suited for God’s word. Great post today by Esta about her first trip to a shooting range (yes, a seminarian with a loaded Armalite. Be afraid. Reminiscent of Gandhi 2: No More Passive Resistance!). I too am coming to the conclusion that one’s faith is too important to just pledge church membership before one is old enough to drive. Then down the gullet of next year slips. Esta found a minute to update her blog amid the hectic joy of starting classes at seminary (finally having Internet connectivity at her apartment might have something to do with it). She reports that she’s making friends, even if they do tend to be considerably younger than she is; that Julia Child’s recipe for baked cucumbers is as good as Julie Powell reports; and that updates on classes are forthcoming, including Hebrew I (I always wanted to be able to read Biblical Hebrew; now she’ll be living the dream! Sniff.). Hope she can keep posting. And hey, Esta, if you haven’t discovered them yet, you might want to download NetNewsWire Lite and Manila Envelope. The former will make it MUCH easier to keep up with your weblog reading; the latter just might make it easier to post. Since the latter is Esta’s weblog host, that’s good news for her too. … What? It’s for my wife. Get over yourself. Through the entire expedition I’d been taking pictures like a madwoman, with my aunt joking about Pulitzer prizes. I had my Dad’s camera slung around my neck, and took rather painstaking care with focus and light, hunting for unique perspectives. From the cove we went to Antioch church, where my grandparents and many other relatives are buried. I took more pictures of the headstones, documenting dates and relations for future reference. Willie, Johnnie and Alice; distant cousins I hadn’t known existed, all dead before they reached 25. A Lunsford ancestor who died in the Spanish-American war. Obidiah and Polly O’Dell — I don’t have enough time for all the stories about them. Yeah, lots of pictures. Too bad there wasn’t any film in the camera. I talked to her late yesterday morning as she was driving home. She’s bringing back a stack of recipes from my grandmother’s collection. Apparently most of them are clipped rather than written down, since she mostly made up what she cooked, except for cake recipes. But we’re still hopeful to find some gems.